“5.https://laurabruno.wordpress.com Laura’s blog is a wonderful blend of all things spiritual. One is always uplifted by spending some time reading her posts. I very much enjoyed reading Cnawan’s gloss of his other eight blog picks. What a fabulous and varied collection of interests and people, especially photographers and poets! 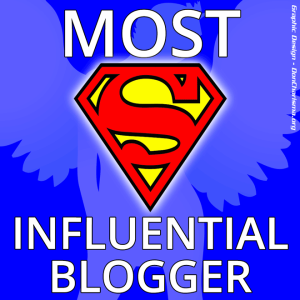 A Most Influential Blogger Award brings with it somewhat kooky instructions, including the requirement for posting a current favorite song. I don’t really have a current favorite, but I’ll post a song that’s been stuck in my head since last summer. I literally “hear” this particular version of this particular chant running through my head at least several times per week, even in my sleep! 1. Colette O’Neill of http://bealtainecottage.com inspires and informs with gorgeous photos and Earth wisdom from her smallholding in Ireland. I discovered her blog shortly before we rented the crazy, wild yard that came with our gut-rehabbed house in Goshen, Indiana when we moved here in 2012. Bealtaine Cottage took my flickering interests in permaculture, wild foods and gardening and ignited these into full-blown passion for bringing beauty to all of these things. Who knows how many others she has inspired in this way! 2. Continuing the permaculture trend, Ann Kreilkamp of http://exopermaculture.com brings her always insightful and eclectic pondering to everything from healing the land, ET Disclosure, sharing economies, tiny homes, astrological charts of the notorious and influential, and her beautiful family vignettes. Ann lives and models permaculture and the sharing economy through the GANG Community garden on the property she purchased next to her house in Bloomington, IN. I’ve had the honor and joy to meet Ann in person, and through her blog, I learned of her son Colin’s Garden Tower Project , which has become its own talking and focal point in our yard. We didn’t need the extra garden space, but I had a feeling that displaying a well-planted Garden Tower would inspire others with disabilities or minimal yard space to try gardening anyway. And so it has! Ripple effects galore. I also love Ann’s commitment to her neighborhood and extremely local grassroots activism. 3. Finishing up the permaculture category (because permaculture really can solve our world’s greatest challenges): http://milkwood.net: homesteading skills for city and country. Milkwood comes to us from Down Under. I love seeing lush gardens in December! I also enjoy the family and workshop photos and reflections, as well as instructions for so many self-sufficiency projects wherever you happen to live. 4. Emily of http://virgomagic.com offers keen astrological insights and glorious collages that speak straight to the heart and psyche. Her blog posts always seem to capture deeper layers and nuances of more general readings. 6. Laura Daligan is more of a vlogger (videos) than blogger, although she does offer both. Her chatty videos are so chock full of information that I can’t believe how easy, breezy and charming they all sound. An artist, tarot reader, and lover of animals, trees, Faeries, Ancient lore, and more, Laura Daligan shares her wisdom on The Witchcraft Diaries YouTube channel and the blog connected to her main site, http://lauradaligan.com. 7. I followed the always beautiful, tasty and informative newsletter of Cecilia Kinzie of http://rawglow.com/blog/ even before she was Cecilia Kinzie and before she had a blog. Then, synchronicity of all synchronicities, I wound up living in the same apartment complex as her for 13 months in Sonoma County, California! Cecilia offers a wealth of raw food and whole food information, intermixed with grounded spiritual wisdom and an artist’s eye. She also offers delicious and simple raw vegan and lightly cooked recipes. 8. This next one would make it for the name alone: http://thenerdyfarmwife.com . In all seriousness, though, I love her humor and the wide variety of crafts and DIY projects to make with herbs, dandelions, roses and more. This is a great site for learning how to make your own natural beauty products. In a toxic world, we need more nerdy farm wives! Reblog of well deserving honors for all mentioned. I followed Laura’s Blog for a number of years now. She was my dear Reiki Teacher. I met Tania through Laura’s blog. It’s been such a joy and pleasure to receive their posts. They both speak to my heart and my head. So blessed that they are doing what they do. I’m also very grateful for the list of bloggers they have shared as their favorites. Congratulations on your nominations! Hugs Dawn! Thank you for being the voice that you are. You devote yourself to this labor of love with all your heart and passion. It is so appreciated by me and many others! God Bless. Thanks so much, Dawn! Many blessings and lots of love!